In 1789, as the French Revolution shook Europe to the core, the new United States was struggling for survival in the face of financial insolvency and bitter political and regional divisions. 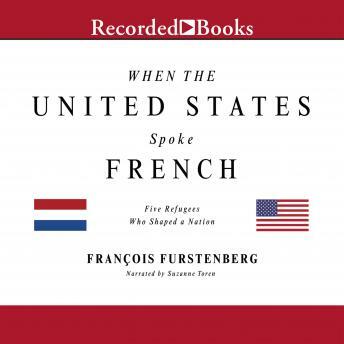 When the United States Spoke French explores the republic' s formative years from the viewpoint of a distinguished circle of five Frenchmen taking refuge in America. When the French Revolution broke out, these men had been among its leaders. They were liberal aristocrats and ardent Anglophiles, convinced of the superiority of the British system of monarchy and constitution. They also idealized the new American republic, which seemed to them an embodiment of the Enlightenment ideals they celebrated. But soon the Revolutionary movement got ahead of them, and they found themselves chased across the Atlantic. Francois Furstenberg follows these five men-- Charles-Maurice de Talleyrand-PErigord, Napoleon' s future foreign minister; theoristreformer Rochefoucauld, the duc de Liancourt; Louis-Marie Vicomte de Noailles; Moreau de Saint-MEry; and Constantin-Francois Chasseboeuf, Comte Volney-- as they left their homes and families in France, crossed the Atlantic, and landed in Philadelphia-- then America' s capital, its principal port, and by far its most cosmopolitan city and the home of the wealthiest merchants and financiers. The book vividly reconstructs their American adventures, following along as they integrated themselves into the city and its elite social networks, began speculating on backcountry lands, and eventually became enmeshed in Franco-American diplomacy. Through their stories, we see some of the most famous events of early American history in a new light, from the diplomatic struggles of the 1790s to the Haitian Revolution to the Louisiana Purchase in 1803. By the end of this period, the United States was on its way to becoming a major global power. Through this small circle of men, we find new ways to understand the connections between U.S. and world history, and gain fresh insight into American history' s most critical era. Beautifully written and brilliantly argued, When the United States Spoke French offers a fresh perspective on the tumultuous years of the young nation, when the first great republican experiments were put to the test.